Our vision is to establish The Sidmouth Nursing Home as the leading centre of excellence in elderly people care. This involves focusing firmly on those things in which we excel and at building specialist services, which are based on specific skills, a research base and a team approach. We wish to promote a learning organisation responsive to individual need and equal opportunity, one that can boast continuous research and development. The Sidmouth Nursing Home aims to provide comprehensive nursing care services to the highest standard to elderly people. We also admit residents under the age of retirement. A full initial assessment is carried out by a suitably qualified professional, prior to admission, to ascertain whether the home can offer the type of care required for that person and a trial period is offered. Residents can also be admitted in an emergency. The Home aims to provide 'patient - centred care' by placing its emphasis on the individual. The Home also provides palliative care as all nurses are fully trained in this area. We work closely with the local Hospiscare Team. If you are interested in our Day Care services, please contact the Manager to discuss your individual requirements. We can offer respite care subject to availability. Please contact the Manager to discuss your individual requirements. There are a range of activities taking place. 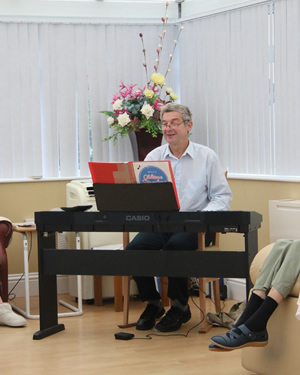 A gentle exercise class and sing song takes place every Wednesday afternoon. We have a drama therapist, Chris Hill who regularly visits the home and who encourages residents' creativity and well-being through reminiscence, poetry writing, drama, music and craft work.' See recent work completed with the residents entitled ‘Glorious summer’. A choir sings every other month. A chiropodist and hairdresser visit on a regular basis and a Holy Communion Service is taken within the home. Musicians come and play at the Home throughout the year. Relatives and friends are welcome to visit at any time of the day. Trips to the sea front and local attractions are arranged whenever possible. Our home consults regularly with specific Healthcare Professionals who advise on more complex nursing needs in order to ensure that nursing input is maintained to an excellent standard.